Position: The so called “45-degree angle” is not a requirement. The 45-degree angle is often suggested in the litature because this angle often allows for the identification of the venous pulsations. The column of blood arising from the right atrium is fixed. 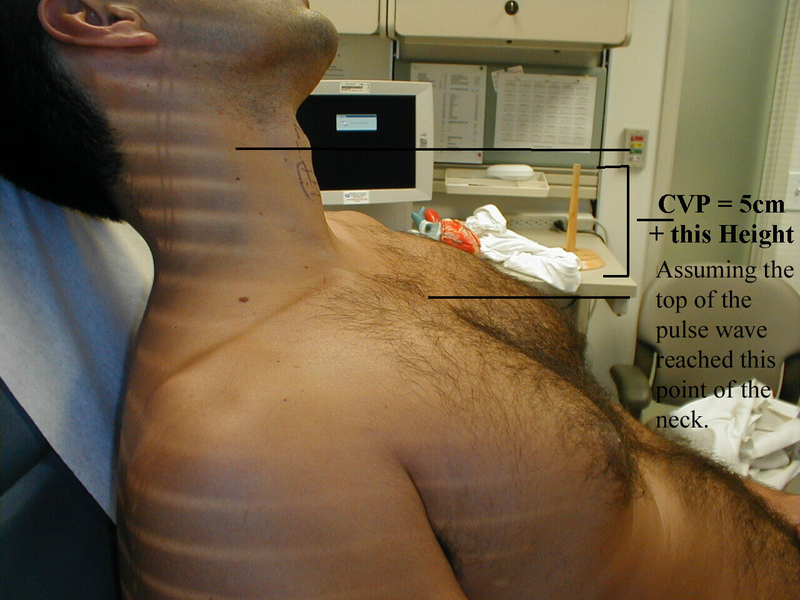 The angle from the patient (using trunk, not neck) to the bed can change but not the column of blood (Figure 1). For example, if a patient is dehydrated you may not observe the JVP if the patient’s angle is higher than the column of blood arising from the right atrium. Therefore, the angle needs to be reduced until the JVP is observed. Likewise, if a patient is volume overloaded the column of blood arising from the right atrium may be higher than the angle. Therefore, the angle needs to be increased. Once the venous pulsations are identified, turn the head slightly towards left shoulder so that the neck muscles are relaxed. This is important so that the sternocleidomastoid muscle is not excessively tensed, thus compressing the external and internal jugular veins and obliterating their pulsations. The best way to identify the waves (ascents and descents) would be to simultaneously auscultate and observe the wave pattern. Note: h wave – between the bottom of ‘y’ descent and beginning of ‘a’ ascent, during the period of diastasis (relatively slow ventricular filling). Venous hum: Continuous bruit over neck veins (normally noiseless) due to increased velocity of blood flow or decreased viscosity of blood. Reason: During inspiration venous return to the right side of the heart increases due to increased negative thoracic pressure. However, this is accommodated by the inspiratory decrease in pulmonary vascular resistance. As a result, pulmonary artery, right ventricle and right atrial pressures fall inspite of increased venous return. During expiration, due to increased positive intrathoracic pressure, pulmonary circulation is compressed by the thoracic cage resulting in increased pulmonary resistance and pressure. Technique: When pressure is applied over the liver by pressing firmly below the right costal cartilage margin f0r 30 seconds, the venous pressure gets exaggerated initially due to increased venous return. Later the myocardium accomodates the extra venous return and the level falls. This test also helps to differentiate venous pulsation from the arterial pulsation. In an infant, the liver is the only guide to the recognition of elevated right atrial pressure as the JVP is difficult to delineate. 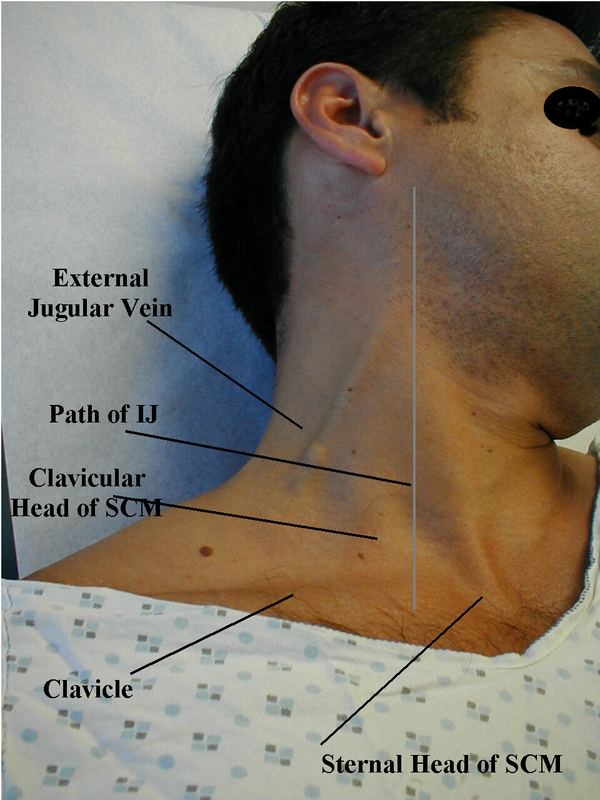 Identifying the jugular venous pulsations (JVP): Look between the two heads of sternocleidomastoid (Figure 1). Tangential lighting helps as this can show you the contour of the jugular venous pulsations. The glare from room lighting or the setting of a dark room may hide the contours. I often use the light on my iphone but a pen light will work well too. The examiner should observe the rise and fall of the venous pressure during normal inspiration and expiration. Normally, the mean venous pressure falls during inspiration. The external jugular (EJ) runs in an oblique direction across the sternocleidomastoid and, in contrast to the internal jugular (IJ), can usually be directly visualized. If the EJ is not readily apparent, have the patient look to the left and valsalva. This usually makes it quite obvious. EJ distention is not always a reliable indicator of elevated CVP. EJ has valves which are designed to prevent the retrograde flow of blood causing it to appear engorged even when CVP is normal. It also makes several turns prior to connecting with the central venous system and is thus not in a direct line with the right atrium (Figure 2). The examiner must distinguish between venous and arterial pulsations, and that the top of the venous column is recognized. The former is accomplished by seeking the biphasic x and y waveform (Figure 3) in the venous pulse and comparing them to the carotid arterial pulse. I find it easiest to observe the pulsations in the right side of the neck while timing the carotid pulse in the left side of the patient's neck using my right index finger. If I am still uncertain as to whether or not I am observing the venous pulse, I try to obliterate the venous pulse by placing my right thumb or index finger across the base of the patient's right neck. By compressing this area with a force of approximately 10 to 20 mm Hg, the venous pulse can be obliterated. Movement that remains will then be observed to have the characteristic monophasic contour of the carotid pulse. Another helpful technique that can identify JVP is the hepatojugular reflux. The examiner applies firm but persistent pressure over liver for 10 seconds while observing the mean jugular venous pressure. 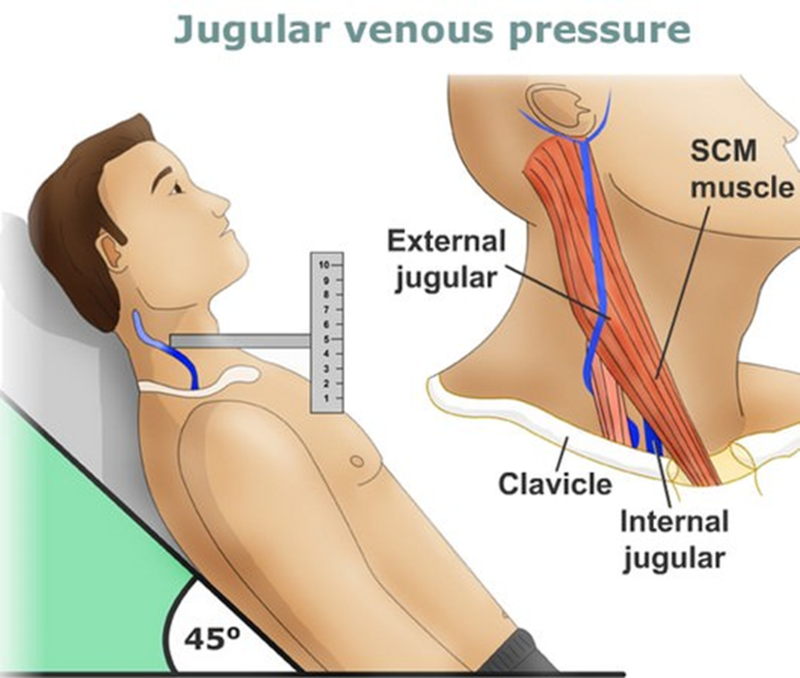 Normally there is either no rise or only a transient (2 to 3 sec) rise in mean jugular venous pressure. A sustained increase in the mean venous pressure until abdominal compression is released is abnormal and indicates impaired right heart function. 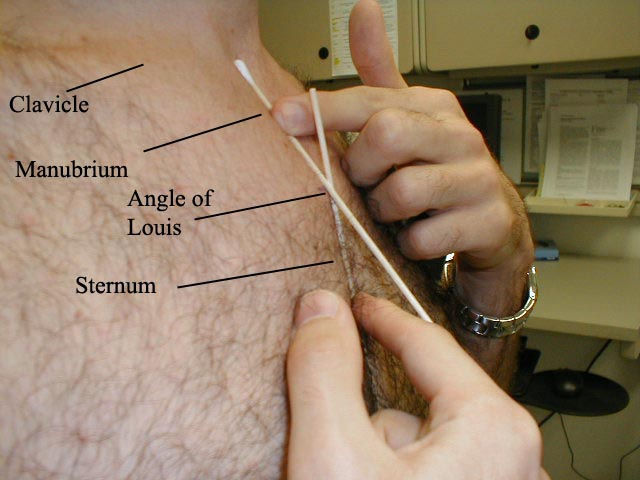 Locate the sternal angle (Angle of louis): It can be felt as a transverse prominence, about 5 cm below the suprasternal notch at the level of 2nd costal cartilage (Figure 4). 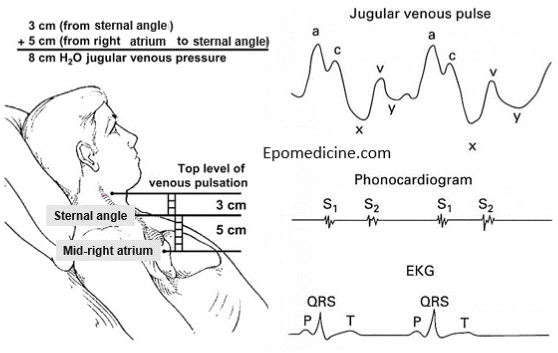 4) Measurement: Measure the vertical distance (in cm) between the horizontal lines drawn from the upper level of venous pulsation and the sternal angle. This can be done by using 2 of either or a combination of pens or rulers – one placed horizontal to the upper level of pulsation and another taking the vertical distance of that ruler from the sternal angle (Figure 1). 5) Calculation: Calculate the right atrial pressure: Normally, the center of right atrium is 5 cm below the sternal angle. Hence, Add +5 cm to the above measurement to obtain the right atrial pressure. The exact conversion is 1.3 cm of H2O or blood = 1 mmHg (Figure 5). 3.	c wave: due to impact of the carotid artery adjacent to the jugular vein and retrograde transmission of a positive wave in the right atrium produced by the right ventricular systole and the bulging of the tricuspid valve into the right atrium. 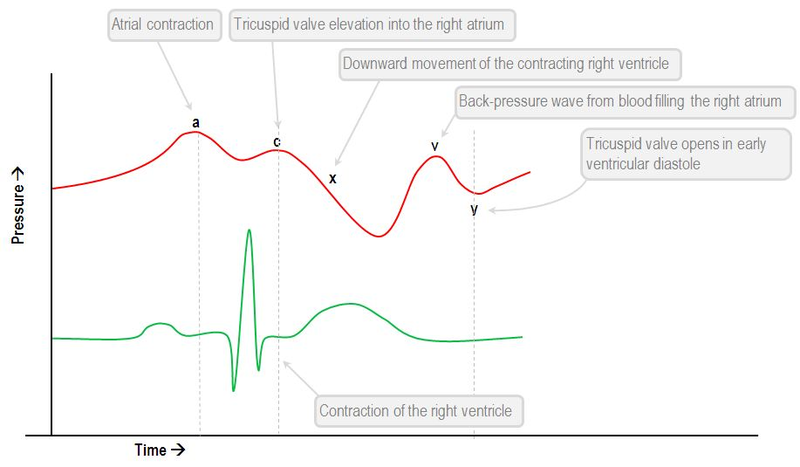 6.	y wave (descent): due to opening of tricupsid valve and subsequent rapid inflow of blood from right atrium into the right ventricle leading to a sudden fall in right atrial pressure.